A new study by the American Association for Justice shows that 28,000 motor carrier companies, operating more the 200,000 trucks on American roadways, have violated federal safety regulations. Literally hundreds of Georgia trucking companies were listed as having safety violations. That’s mind-boggling, isn’t it? And scary. There is no question that the motoring Georgia public takes the brunt of these intentional violations. 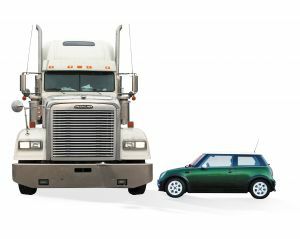 If you have the misfortune of being involved in a collision with a tractor-trailer or other large commercial truck, you are likely to sustain some pretty serious bodily injuries. Another thing that disturbs me about Georgia law is that currently those tractor-trailers that travel only within the state limits of Georgia are required to carry only $100,000.00 in liability insurance, compared to interstate tractor-trailers, which are required to carry $750,000.00. Georgia is way behind on this issue. The reality is that a tractor-trailer that is intrastate (traveling only inside Georgia) is just as likely to kill or maim you in a collision as is an interstate (traveling from state to state) tractor-trailer. I hope I will be able to make some progress with the Georgia General Assembly next session on this issue. Meanwhile, do your best to stay away from tractor-trailers while driving. Keep a lane in between your car and the truck. I once an an accident reconstructionist tell me never to drive side by side with a tractor-trailer and just let them go on down the road and stay clear of them. Wise advise from someone who, like me, had seen the end results of too many tractor-trailer accidents.